President of JAGH, Prof. Dr. Makoto Taniguchi (Vice President of IAH, Asia), participated in the 2017 International Symposium of Groundwater, which was organized by Korean Society of Soil and Groundwater Environment, held in Jeju, Korea. This symposium focused on sustainable groundwater and global cooperation under the environmental change, and it is for commemoration and publicity of IAH2018. International Association of Hydrogeologists (IAH) meeting was held in Dubrovnik, Croatia. Twelve members from Japanese national chapter participated. Asian Chapters meeting was held during IAH2017 in Dubrovnik, Croatia. Six Asian countries members including Korea, China, Thailand, Indonesia, Malaysia, and Japan participated. President of JAGH, Prof. Dr. Makoto Taniguchi (Vice President of IAH, Asia), participated in the 9th Jeju World Water Forum which was organized by JPDC and UNESCO-IHP, and held in Maison Jeju Grand Hotel, Jeju city, Korea. President of JAGH, Prof. Dr. Makoto Taniguchi (Vice President of IAH, Asia), participated in the Australasian Groundwater Conference 2017, which was held in the University of New South Wales. MOU between Japanese Association of Groundwater Hydrology (JAGH) and National Ground Water Association (NGWA) has been extended for another three years. Advancement of the groundwater research, management, protection, development and education. Providing a common meeting place for scientists, engineers, and those who are interested in groundwater related issues. Collection or organization and dissemination of information on groundwater science and technology. including scientific exchange among scientists, engineers, educators, managers and regulators. The activities are funded by the membership fee, registration fee of the meetings and donations. Groundwater has many important roles for nature and societies such as playing a part in the water cycle, water resources, dissolved material transporters, land, and culture. A new “Water Act” was recently passed through the Japanese Congress in 2014, and it is in function. New “Water Management Plans” and the “Groundwater Protection, Use and Recharge law” are now being developed through many discussions with stakeholders. JAGH as an expert group of groundwater hydrologists will take a lead and contribute to the science and technology in society under the co-design with stakeholders, in particular with local and national practitioners. Groundwater in Japan has a relatively low ratio of total water use, at about 12%. However, groundwater is recently getting more attention because of its stability as a water supply and resilience to risks including climate change. 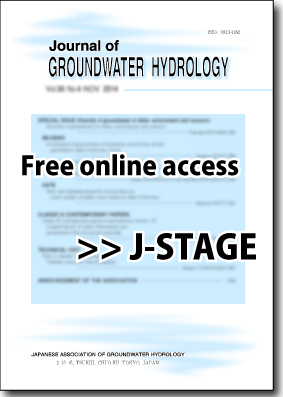 Our knowledge, methodologies, and techniques of groundwater hydrology can be widely used for proper regional and local groundwater governance beyond groundwater management. JAGH was established in 1959, faced several groundwater problems, and solved those problems, such as severe land subsidence due to excessive groundwater pumping during 1960-1980, groundwater contaminations during 1990’s and 2000’s, and groundwater management such as groundwater as commons during 2010’s and the present. JAGH is excited to work with all groundwater hydrologists and stakeholders, and I am very much looking forward to your participation in JAGH activities. JAGH Membership offers an excellent opportunity for you and your corporation to be in contact with other groundwater specialists and hydrologist. Anyone interested in the objectives of the JAGH is eligible for membership and may become a member upon payment of membership fee. A regular member who are older than 70 and have made great contributions to groundwater hydrology, development of groundwater project ,and management of the association shall receive Honorary Membership. Corporations, institutions, and organizations which support the objectives of the JAGH may join a corporate member. The level of benefits varies according to the number of “lots” you acquire. *The first author of a manuscript contributed to the journal must be a regular/student member of JAGH.